FTI International Group Inc. Integrated CNG Storage system for land based storage of natural gas. In the FTI Integrated CNG Storage system, the same advanced pressure vessel, support, and Mani folding technology as used in the road, rail, and marine applications, are deployed in a land based system designed to meet peaking-loads of gas fired processes, especially gas-fired power plants. 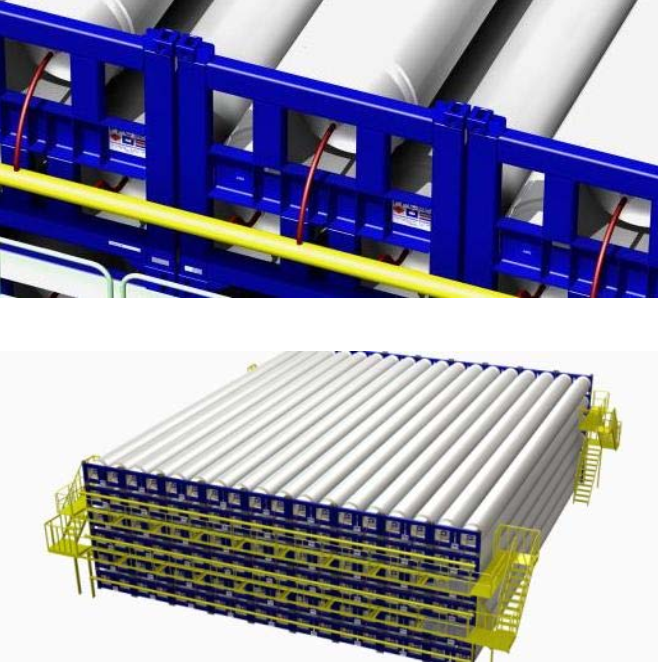 In storage applications, sets of two pressure vessels can be stacked above or below ground and Mani folded together in a similar manner to the ship-board systems. The storage system is charged during times of low load, and discharges at times of high-load to feed increased energy demand, this method stabilizes the loads on natural-gas infrastructure, and allows plants to buy and store fuel when demand (and therefore price, in many areas) is low. Projects utilizing the FTI CNG storage system require a sub-license for use administered by FTI International Group Inc. The CNG system for road use is an ISO Container formatted support arrangement of either two or three pressure vessels. This unit is then mounted on a specially designed dual or tri-axle road trailer suitable for North American and International markets. Both the trailer and container are design to incorporate pressure and thermal growth requirements. Depending on the regional weight restrictions under which the trailer will operate, approximately 4500 to 7500 cubic meters of gas can be carried in a single trailer. A common loading/unloading connection is designed into the system’s header piping. All controls are housed in the back of the trailer behind locked doors. Gas conditioning, compression, JT valves and heaters can be supplied to ensure complete integrity of the system. Continuous collection and supply of gas is achieved in a similar manner to the ship/barge operation, just on a smaller scale. At all times there is one truck loading, one unloading, and at least one in transit, such that as one truck finishes loading or unloading, another is connecting and a seamless switchover can take place, ensuring near constant flow. Customers off the pipeline route.